beef “bone broth” . . .
During our trip to Puget Sound, I had a chance to learn about wellness foods from my daughter, M. who has been following a beyond-Paleo kind of diet: no grains (rice, wheat, flour); no vegetables growing below the ground (potatoes,) no dairy (including cheese!) no sugar. Plenty of eggs, uncured bacon, broccoli, spinach, chard, kale, collard greens, wild fish, organic chicken and grass-fed beef in small portions. She had a chance to tell me about homemade “bone broth.” It sounded similar to the homemade vegetable broth that I made a couple of weeks ago, a tasty broth for vegetable soups, sauce for veal chops piccata and other dishes. What I froze two weeks ago has been used up by now. So today, I thought I’d explore making a beef bone broth using some of the vegetables I had left over from making the vegetable broth, adding roasted marrow bones. A couple of things stood out for me when I reviewed a few online articles about making bone broth. One was to ROAST the bones or any beef before boiling. This brings out the flavor and decreases the amount of foam that rises when cooking broth using raw meat ingredients. 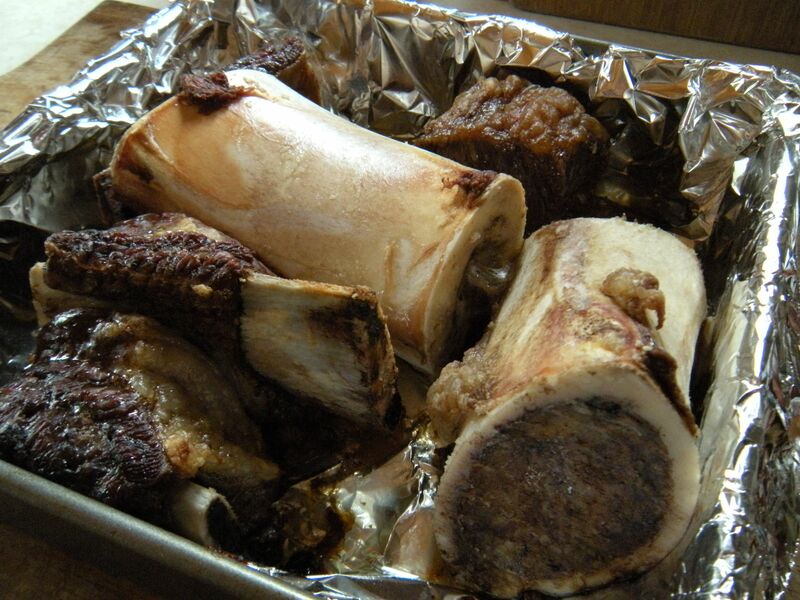 M. also noted that she uses beef short ribs in addition to soup bones and it was best to use grass-fed beef when possible. The beef short ribs and bones roasted in the oven at 375 degrees for about an hour. After it cooled, I browned some veggies in olive oil: leek, vidalia onion, carrots, a parsnip and some celery, about one-third the amount of vegetables that I used in the vegetable broth. Then, I added the roasted beef and spring water to the top of the stockpot. A handful of cherry tomatoes from the garden and a spoonful of instant dashi went in at the end. 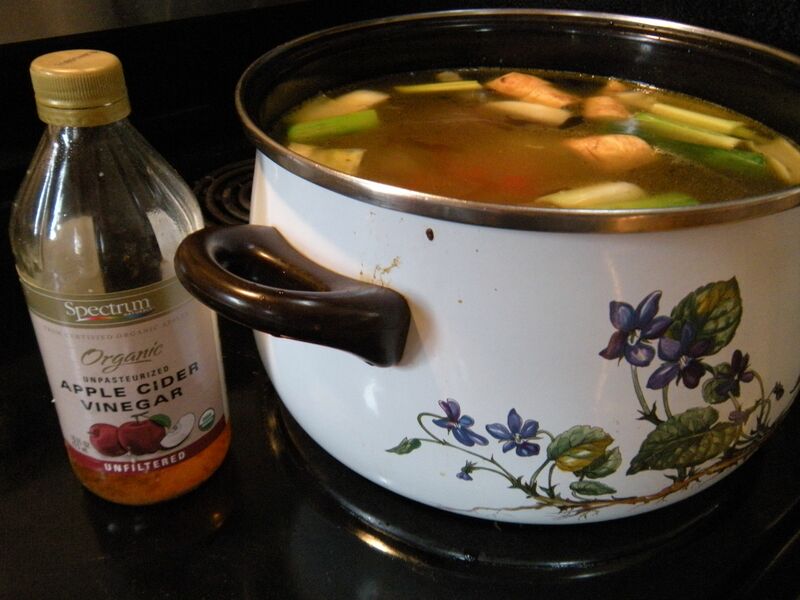 Two tablespoons of organic apple cider vinegar reacts with the bones and draws out the goodness that heightens the healthful quotient of the bone broth. Oh, and the other thing the recipes noted was to bring the soup to a boil but do not boil it–just simmer it very gently for a few hours (up to 48 hours!) Yeah, my eyes popped out when I read that too. But then I remembered the Japanese film called “Tampopo” where they spend the whole movie making a delicious soup broth base for their ramen noodles. In that case, pork bones were kept simmering for days. It’s the beginning of September and the weather is dry and sunny with a gentle breeze. Cool enough to be simmering stock on the stove, although just think of what it would be like to be making continuous vegetable and bone broths during cold winter months? People relate that they drink a bowl of bone broth everyday. To me, that would mean making it constantly because you’d be consuming it almost like tea. 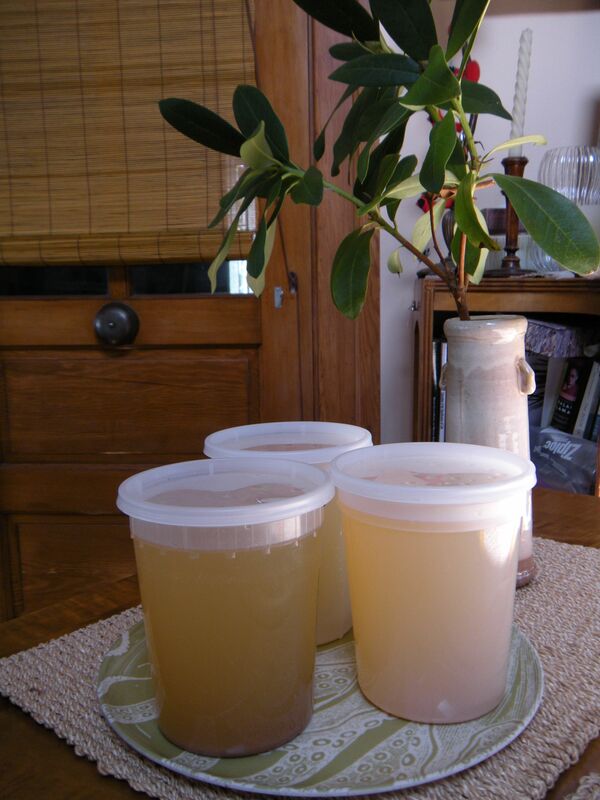 Experimenting with making homemade broths has been a revelation. I used to think about making broth as a luxury, carried out by high-end restaurants and super-chefs, using whole chickens and all those great vegetables just to strain it all out at the end. But no more. What I learned from making that one batch of vegetable broth is how incredibly flavorful the stock is. There is a hint of umami taste too which is intangibly elusive to describe. The beef broth cooled overnight and I skimmed off half cup of fat from it. 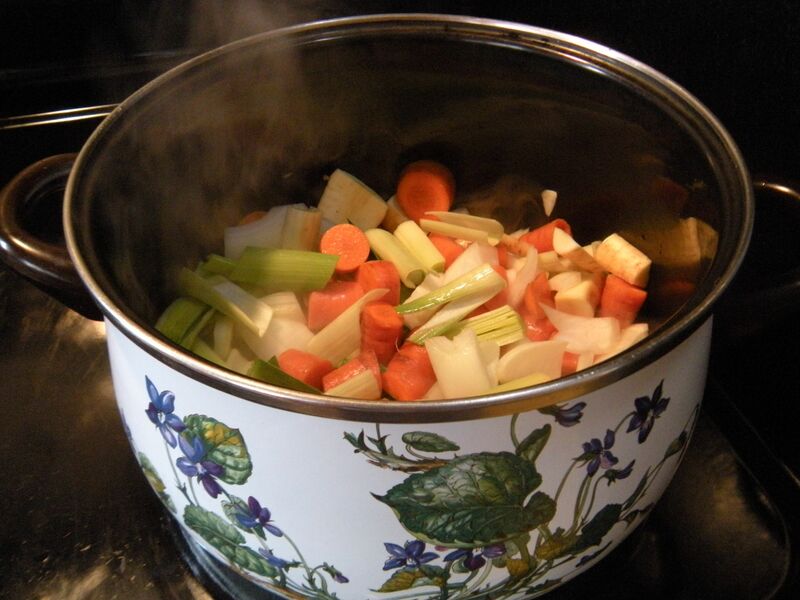 I used to buy cans of chicken and beef broth to add to stews, soups, glazes and sauces. Having begun to make stock myself, I’ve realized it can enhance flavor while imparting a clean taste. All it takes is a little planning, washing, preparing vegetables and roasting bones as sous prep. Browning the vegetables in olive oil, adding bones, skimming foam and keeping the stock to a simmer is all there is to it. I’ve strained the broth and reserved some for our supper tonight. I plan to boil some udon noodles separately and then add to the broth along with bits of beef, organic spinach and thinly sliced mushrooms. Along with fresh, crisp bean sprouts and a few fresh mint leaves from the garden on the side, the dish resembles a Vietnamese Pho. At the oriental market today, I noticed that they had pork and chicken bones. My next broth experiment might be a combination of roasted pork and chicken bones, green onions, fresh ginger root, diakon and perhaps chinese chives. 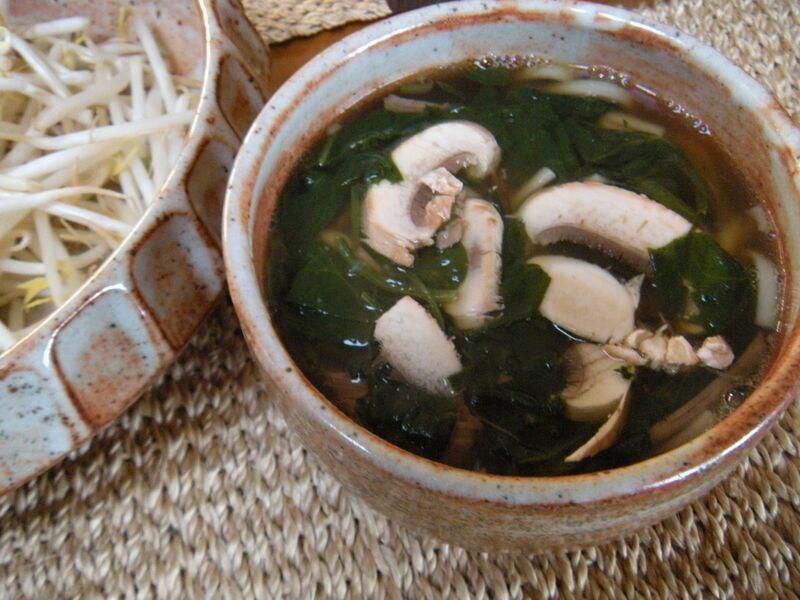 It might resemble a “Tampopo” type broth to add to fresh ramen noodles and snow peas–or as a clear stock for winter melon soup with shitake mushrooms. beef bone broth with udon, spinach and mushrooms . . . I just remembered that David Chang, in his cookbook entitled “Momofuku” gave a broth recipe that required using a ton of ingredients and simmered for days on end. I’ll have to dig that out and see how different it is from the one I made today. It’s fun to see where making broth is not a mere boiling exercise, but how the results have the potential to transform one’s cooking for just about everything. Hey, remember that old folk tale called “Stone Soup?” Weary soldiers who have nothing to eat make a soup made with a huge pot of water and washed stones because there is no food to be had. As it is boiling, curious villagers come to see what is cooking and begin to volunteer some of the foodstuffs they have hidden from the soldiers: some bones with meat on it, barley, vegetables and more grains. Before long, there is a huge pot of delicious, hearty soup, enough to feed everyone! This is sort of like that. Making this or vegetable broth doesn’t take a village, just a little planning and patience while the broth quietly simmers on the stove. Yum! I’ll take your Stone Soup any day… makes my stomach growl just thinking of all of these delicious broths! LOL! Let’s get together in a couple of weeks in October to have some soup together ! sound good?